Do you love music and want to know what 14 grams of happiness looks and sounds like? 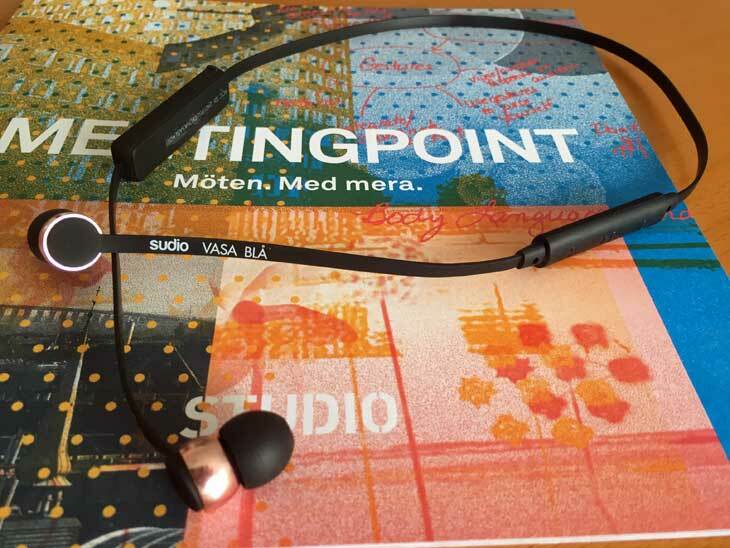 Then you should have a look at this article about Sudio´s new Bluetooth in-ear headphones: Sudio Vasa Blå. It is a very impressive pair of headphones, with both looks, sound and functionality. Continue reading for full review. 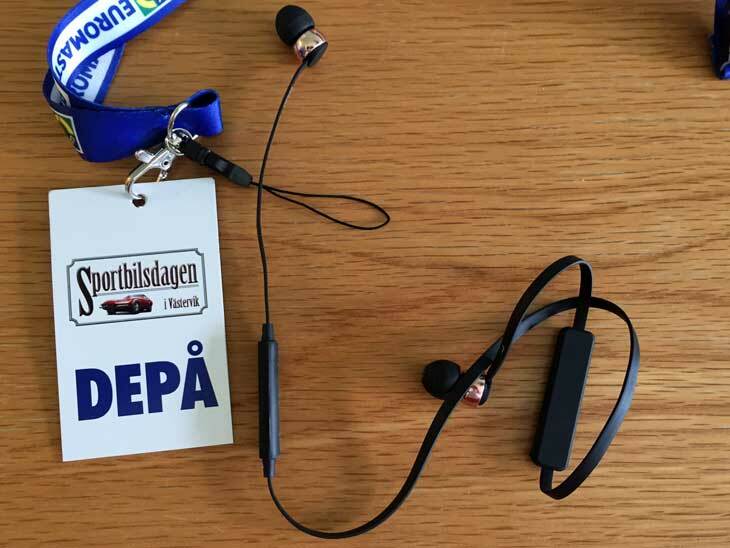 I have previously used headphones from suppliers like Bose, Klipsch, Nocs, A-Jays, Sennheiser, Sony, AKG and Shure. I am not an audiophile but I consider myself experienced and competent enough to give Sudio Vasa Blå a fair review. This is simply a cord with an in-ear speaker in both ends. There are 2 thicker parts on the cord to house microphone with controls and battery. There are similarities with the Sudio Vasa Blå and the Sony SBH70 and SBH80, but Sudio Vasa Blå is a lot more stylish. Feels more like a fashion accessory than a mobile phone accessory. Total weight is 14 grams which makes them very comfortable to wear around one´s neck for a full day in cordless freedom. Sudio Vasa Blå accompanied me to the car show “Sportbilsdagen” in Västervik, Sweden. The sound quality when listening to music and calls is excellent! These headphones are definitely worth their price, without a doubt. Personally, I like the soundstage with thumpy but not overwhelming bass, clear mids and highs. Vocals are important to me and vocals come across clearly, which is not always the case with more expensive headphones. I flew Frankfurt – Mexico City and enjoyed music during the whole flight and I am very satisfied with the insulation from outside noise. Actually to the extent that I did not miss noise cancellation at all. Personally, I prefer ease of carrying than a bulky headphone. Please note, not all airlines allow the use of Bluetooth-headphones in flight. Lufthansa was no problem. Due to the design it is sometimes hard to position the microphone to get clear sound for the person at the other end of the line. At a few times I have gotten complaints that my voice is muffled or sounds canned, but I think it depends on the position of the headset. Just make sure you have positioned the headset correctly and you will be fine. Once again, listening to the other person is always good. I am very impressed by the build quality of the Sudio Vasa Blå even though it only weighs 14 grams! With such a low weight my first guess would be that the manufacturer has opted for cheap and light materials, but this is not the case. The headphones feel solid and like they are built to last. Pairing is the standard procedure for IOS, so if you have paired other devices you will know how to do this without reading the manual. Once it is paired you will see a small battery indicator to the right of your Bluetooth symbol. In the pull-down menu you will see percentages for both your phone battery and your headset in a widget, which is very handy. My Sudio Vasa Blå at the office. I left home with the headset fully charged on a Friday morning. Used it at the office to make several short calls during Friday, listened to music and made a few calls during the weekend. I had plenty of battery left on Monday evening but I charged it anyway, just to be on the safe side. I have read reviews stating 8 hours’ battery life in use and 10 days in standby and I believe this is true. A nice feature is that the headphones will automatically turn off after having been disconnected for 10 minutes. I had huge problems getting acceptable sound from a new but cheap Bluetooth headset when playing Spotify on my Samsung Gear S3. Standing still it was no problem, but as soon as I started logging a run with the Samsung Health app, the Bluetooth stutter started. It stuttered so much that it was an unusable combination. I dug out my trusty Sudio Vasa Bla and enjoyed perfect sound quality during my entire 7 km run. Here is a handy tip: use a rubber band to hold up the loudspeaker band if you are bothered by cable sound when running. I really like this headset, to the extent that it has accompanied me everywhere, both in the office and on several trips, for the last month. Well worth its price and I would definitely buy a new one if the one I have today should get lost. You can get yours at sudiosweden.com. Edit 2016-12-28: I spoke to the good people at Sudio and was offered a 15% discount when you use the code: thinkingoftravel15 on www.sudiosweden.com. This is a great opportunity to get a pair for yourself or someone else you love! 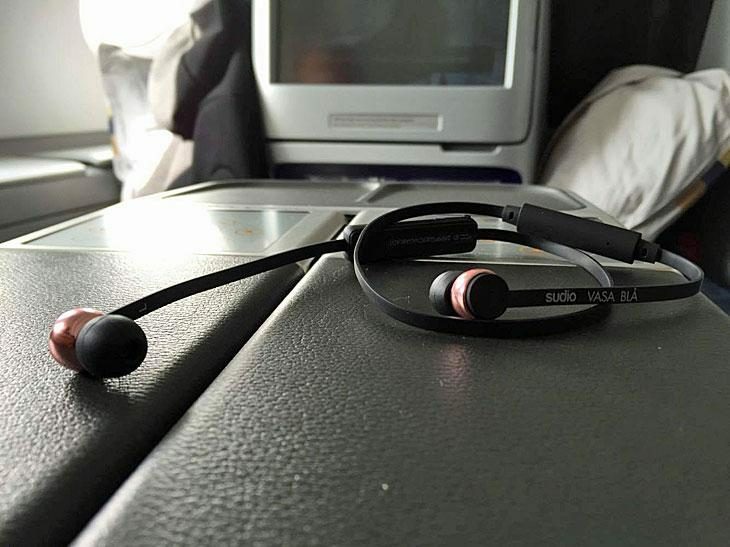 What kind of headphones do you use on your trips? Do you use several different pairs for different occasions? I would love to hear from you via email, in the comments below, on Twitter, Facebook or Google+.